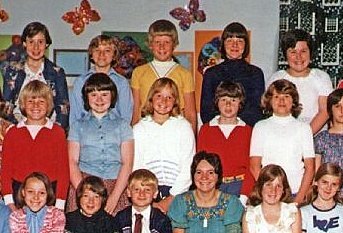 Here I am, aged about 8 or 9, on the back row of my class picture from Croft Primary school. Someone posted this picture on Facebook and it all came flooding back. I am the one in the strange yellow t-shirt and the odd pudding bowl haircut. My sister and I were part of a one parent family, existing entirely on welfare benefits. We lived in a reasonably comfortable house- a suburban semi detached that my mother had bought before she married my father. It was a difficult short marriage and she was left holding the babies, bitter and isolated. Growing up a child of the welfare state in the 1970’s was possibly the best time to do so. Family credit, child benefit, free school meals, clothing vouchers, even help to pay for some school trips that otherwise we could never have been part of. Don’t get me wrong- we had very little, but my mother was very good at scraping together every last penny. But the chronic shortage of money dominated every waking hour- leaving lights on or wasting food was a sin punishable by violence. I lost a coat once and did not dare go home- hiding in the fields for hours. There was food in the house- in the early days my mother fed the babies rather than herself, but as time went on, she began to stockpile dented tins and dried lentils. She is in her 70s now and still does- her kitchen cupboards are full of foodstuffs well past their sell by date but she can not begin to throw out. When you have been hungry and have had nothing, the fear of this returning cuts deep. I mention all this because when I was a child, benefits were worth considerably more in real terms than they are now, even before the axe that our current government has taken to the welfare benefits system. If I had been born 35 years later, it seems almost certain that I would have been one of the 500,000 people that would have needed to visit a food bank in order to eat. Today the Christian charity who run many food banks spoke out in condemnation of the Work and Pensions secretary, Iain Duncan Smith. They have been trying to meet with him to discuss how they might work together to help families better. IDS refused. In fact, he did not even stay till the end of a commons debate on the issue this week. The government agenda is clear. The problem is not poverty, as anyone who is poor should either get themselves a job or manage the benefits they get better. Neither is the problem benefits cuts- these are proportionate with the need manage national debt, and everyone has to do their part. IDS suggested that charities like the Trussell Trust are just scaremongering, following a lefty political agenda. The problem is that some people are scroungers, wasters, layabouts- addicted to hand-outs from the state. Wanting to sponge off the taxes of hard working people. This agenda has been so well peddled by the government and the right wing media that even people on benefits (perhaps particularly them) come to believe it of themselves. Escaping from this kind of sense of failure is incredibly difficult. It also plugs into a certain kind of base me-first middle class mentality. Do you remember the study that I quoted here? Any discussion about welfare is always ideologically loaded. The facts, such as they are, tell a rather different, more complex story. Check out this article that seeks to tackle some of the myths. When confronted by an ideology/political view/power statement that scapegoats marginalised and dis-empowered people it is time to sit up and take note. It is time to ask searching questions of those in power. Above all it is time to listen to the voices of those who are being scapegoated. Everything within me says that this is what followers of Jesus should be doing right now- listening, challenging, engaging. Anyone who has ever spent time with people whom life has broken and pushed to the ragged edge will know that survival is the goal- forget recovery, forget healthy environments for children to thrive within. The margins, slim though they were, that I grew up within are now simply gone. A radio interview with some people visiting a food bank today heard how people were not able to take food that needed to be cooked, as they simply could not afford the energy to cook with. 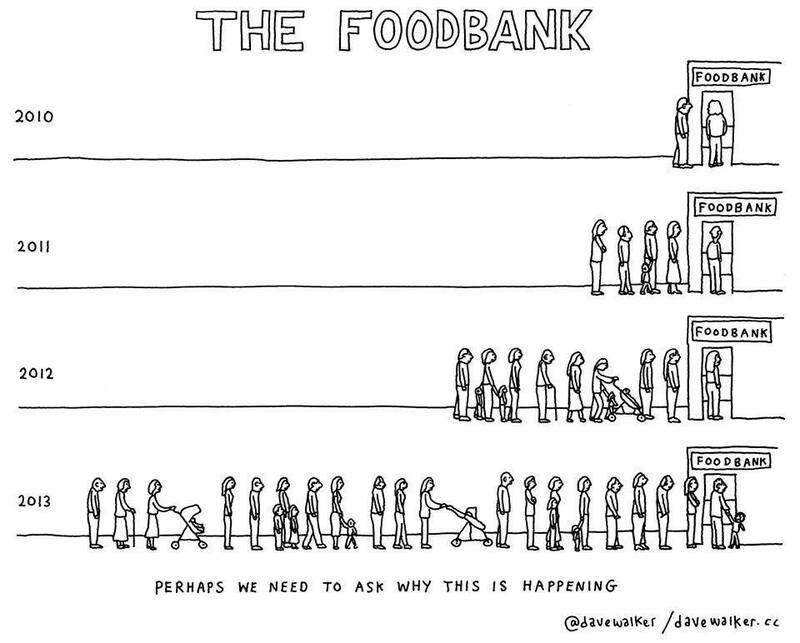 Most of us instinctively think of people who use food banks as ‘other’; ‘not one of us’. Despite my rather different circumstances in 2013 from 1973, I can not say that. The people at the food banks- they are just like me. This entry was posted in Uncategorized and tagged food banks, Iain Duncan Smith, Trussell Trust, Welfare by Chris Goan. Bookmark the permalink.